Brother Jonathan is a nickname for the United States that pre-dates Uncle Sam and John Bull is a nickname for England. 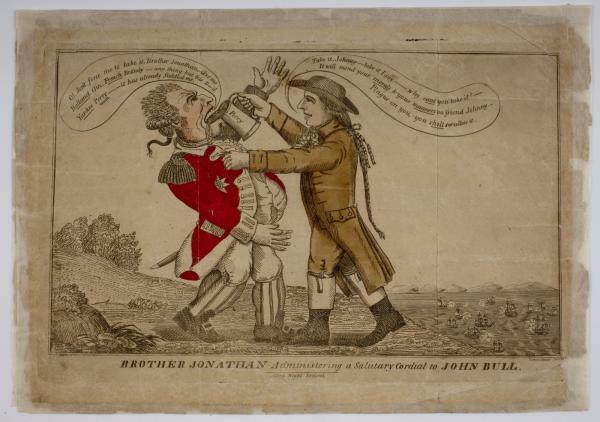 In this political cartoon from 1813, Brother Jonathan is pouring a drink of perry down the throat of John Bull. Perry was a drink made from the unfermented juice of the pear and it would upset the stomach of anyone who consumed it. Perry is also a pun on the name of the naval commander and hero Oliver Hazard Perry (1785-1819), whose defeat of the British on Lake Erie proved to be one of the most decisive battles in U.S. History and prevented the British from gaining control of the Great Lakes. In his first report of the battle to General William H. Harrison, Perry said, "We have met the enemy and they are ours, two ships, two brigs, one schooner, and one sloop." Brother Jonathan is pictured in late eighteenth-century clothes including top-boots and long-cued wig. This may symbolize America as simple, honest, and morally superior to the British who appear bloated and pompous in his bright crimson uniform bedecked with epaulets and medals. In the distance we can see a naval engagement, again a reference to the American victories at sea during the early stages of the war. Although signed "Yankee Doodle," this cartoon was created by Amos Doolittle (1754-1832) of New Haven, Connecticut. Doolittle was a famous early American engraver who created many images of significant historic scenes. As a young man, he marched under Captain Benedict Arnold to Lexington and Concord in 1775, and his experiences there resulted in the first published images of that battle, four copperplate engravings titled the Battles of Lexington and Concord. In the accompanying advertisement for this cartoon, Doolittle wrote, "Although many caricatures extant are of no use, and some of them have an immoral effect, I flatter myself that this will not answer that description. At the present time, it is believe, it will have a tendency to inspire our countrymen with confidence in themselves, and eradicate any terrors they may feel as respects the enemy they have to combat." 1. Frank Weitenkampf, Political Caricature in the United States, An annotated List (New York: New York Public Library, NY, 1953) 17. 2. American National Biography, vol. 17 (New York: Oxford University Press, 1999) 369. 3. American National Biography, vol. 17 (New York: Oxford University Press, 1999) 741. John Bull (left): "O! don't force me to take it, Brother Jonathan - Give me Holland Gin, French Brandy - any thing but this D-d Yankee Perry - it has already fuddled me." Brother Jonathan (right): "Take it, Johnny - take it I say - why cant you take it? - It will mend your morals & your manners too, friend Johnny. - Plague on you, you shall swallow it. Dimensions: 22 x 36.8 cm.